When people experience their expanded nature, they often become blissfully aware of the interrelationship of all life and feel compassion toward others. It is likely that we are designed to experience these qualities. Our individuality is an expression of diversity that retains a common essence. Once we perceive wholeness, we want to serve it, and our small self becomes a larger self that embraces the natural world and other people. Eros symbolizes the force that compels us to discover our life purpose and draws us together with others who have discovered theirs. A more-than-personal vision often accompanies such an awakening. Finding one’s own vision brings connection to others, initiating community. Consequently, similar groups reveal themselves, creating a linking of common interest. Each community is an energetic field whose tendrils—like nerve cells, dendrites and synaptic connections—grow to greet the outreaching vision of others. As we expand awareness, first individually and then communally, we are moved to identify ever more strongly with natural harmony and to surrender our self-centered personal will. The more we do this work, the closer we come to recognizing the creative source within and manifesting its love through action in the world. So many visionaries are activated now. They are essential because, to paraphrase Einstein, we can’t solve our problems from the same state of consciousness from which we created them. The solution is to find the vision that will allow us to move toward thoroughly considered and considerate ways of being together. "Let’s start with conscious activism. I’d go back to Abraham Maslow and how he affected my life. Up to age 35, I had been raising five children but had no calling to act in the larger world other than to conform and do what I had been told was right to do. This led to a deep depression. When I was trying to understand my depression, I read Maslow, who pointed out that every joyful, productive, well-functioning and self-actualizing person has one thing in common: chosen work that he or she finds intrinsically self-rewarding. I began to search for my vocation and discovered, in the process, my own unique creativity—that which gets called into action when it is in contact with something that excites it. For six or seven years I had been searching for the answers in books. I read Maslow, Teilhard de Chardin, Bucky Fuller and many others. Now, I was asking the Universe directly. Then one day, in 1966, while I was walking in a kind of daydreaming state, I was suddenly gifted with a spontaneous, conscious vision of an expanded reality. And in the course of about five minutes I received an enormous array of impressions – ranging from cosmic evolution to what it would be like if the world “worked for everyone,” to use Buckminster Fuller's phrase. In the process, I received a deep vocational calling from my soul. First, it was as if my mind’s eye suddenly projected into outer space. I felt like an astronaut. I experienced myself as a cell of Planet Earth and of the social body of humanity – as each one of us actually is. But I could literally feel the whole planetary body heaving and gasping for breath in the polluted atmosphere. I felt the struggle and the running out of resources. I also experienced a moment of collective pain, which I now associate with 9/11. In response to that collective pain, I could feel the hearts of millions of people opening to the suffering of the world. And I experienced Spirit going through these open hearts and connecting people with each other. I saw us all resonating together and healings occurring within everyone. It was like when Jesus walked through a town and people would be spontaneously healed. It felt like this was happening to us – because in the opening of our hearts to the pain of the world, the social body became a single, conscious organism. And that moment of wholeness rippled through us all. In this vision, I saw that my purpose is to help coordinate this social body as it evolves to a higher level. I glimpsed the new economics, the new politics, the new governing processes and the new environment as an emergent property of the consciousness of people when they feel resonant with and compassionate toward each other. I experienced the emergence of this social body in a flash – not in detail but in essence. And I literally felt humanity becoming one living body on planet Earth, imbued with heart-full consciousness. And as we began to resonate together and coordinate our actions, I felt the lights from other parts of the Universe coming in. I could feel that we were part of a Universe full of intelligent life. It felt to me like we were about to communicate with these other life forms, but that we did not yet know the universal language. What I saw is that evolution is a profoundly intelligent and meaningful process leading through an increasingly complex order to higher consciousness and greater freedom. Although I had read this concept in the works of Teilhard de Chardin, I now actually felt it within myself and understood it through direct experience. I also saw that through our heightened empathy and feeling with one another, millions of people are motivated toward greater action in the world. In this sense there is a movement toward the building of a new world. During the upheaval of the second Iraq war it was said that there is a “second superpower.” It is the peoples of the world. In this sense the vision is being fulfilled now. Of course, it is a cosmic drama, because we don’t know if we will shift our behavior in time to save our environment and ourselves from self-induced devolution. We are the generation of this choice. I became tremendously excited. I studied cosmology, geology and biology to reinforce what I had experienced in those five extraordinary minutes, learning the actual story of evolution from the origin of creation to us, who are now at the threshold of another turn on the spiral. I was and am activated from within to express my vocation within the larger body. Conscious activism for me began with this experience of expanded reality and a vocation or calling that came to me from a higher dimension than my will. Prior to my vision I had been reading through Teilhard de Chardin and others about the story of cosmic evolution. But it was still just a story for me. Dr. Hank Wesselman, the paleoanthropologist and shaman, talks about how information transforms into activation. Using computer language, he says that there’s a single click in which you get information on something. Then there’s a double click in which you actually enter the program. What causes a single click to become a double click is deep, passionate desire. I was excited by what I read but couldn’t incarnate it. The double click was a mystical, transforming experience that seems to have been triggered by a combination of grace, preparation, frustration and the intention to really know what was going on. And during that fateful walk, I underwent a spontaneous, revelatory experience in which I could directly feel that I am composed of subatomic particles, atoms, molecules, cells and organs. What happened was that I essentially and spontaneously decoded my being. I felt as if I tumbled back through the spiral of evolution. It was like seeing a speeded up movie of creation – like a time-lapse film on the birth of a flower – in which you can perceive the underlying pattern. I realized that I am a microcosm of the whole universe, as are we all. And in my consciousness I lived through the formation of the Earth and the first appearance of multi-cellular life. I could see the earliest humans in one sweep. I witnessed all of those events in the story of creation. And I was no longer just getting information about something. I became the information myself. It was kinesthetic and absolutely personal. When I awakened to the realization that I am a cell in the living body of Earth, I could see that we are each an embodiment of the composite resume of the Universe’s entire life span. And latent within us is the memory of the whole process of creation. This form of knowing is called knowledge by identity. You become one with that which you are knowing. My experience showed me that everything that has ever happened is coded in cosmic intelligence. Gregg Braden and others call it the quantum hologram. It has also been called the “akashic record.” When one shifts into cosmic consciousness mode, which happened to me in that flash, the information of the past, present and potential future is instantaneously available because it’s also encoded in our cells. In The White Hole in Time, the physicist/futurist Peter Russell writes that if the information and instructions encoded in a single molecule of DNA were typed out on paper, it would fill a book of 6,000 pages. My conscious mind does not need to know any of this information. But in my sudden experience of cosmic consciousness, I felt that I had access to that coding and to its implications, because we each have the whole system encoded within us. I think that everything exists within the field of universal intelligence and that the Universe is a vast learning experiment with a divine intent, which is to make beings ever more conscious of the consciousness that is creating us. So, when the planetary body – like a biological fetus – arrives at a certain stage of development, then individual members, like organs of the body, are triggered for unique functions. In an instant I was turned on to fulfill my role in the social body, which is to help actualize the vision I was given of our potential future. I believe the consciousness of our planetary body must have precipitated and coordinated the experience, or it would have been fragmented, chaotic and possibly frightening. However, nobody can agree on what actually triggers such anomalous events in our lives, because we are not mature enough in our collective consciousness to really understand. There isn't anybody born anywhere on Earth without a set of creative capabilities that are important to our collective well-being. My vision of the world to come is what I call a co-creative society in which everyone has the opportunity to identify and act upon his or her particular coding, in concert with others. But I think that in the current world situation, not everyone can discover and respond to a unique creative purpose. For the majority of the world’s people, just staying alive and feeding one’s family is too much of a struggle. The great gift for those of us who live in the developed world is the freedom to discover and contribute our creativity into the larger community. It is ultimately the source of happiness and personal growth as well. This is what I learned from Maslow and certainly from my own experience: If I have a genius code that’s pressing me to fulfill my potential – like the force of the oak pressing within the acorn – and I don't respond, I will get depressed. I will feel alienated, abusive, sick, possibly even violent. I would guess that as much as 90 percent of the social ills of the middle class in the world today are because individuals have not found their life purpose or are not acting on it once they know what it is. Experiencing one’s expanded nature is an impulse that comes from the creative source of being – the creator within. By answering it, you fulfill yourself and simultaneously serve. But to say “yes” is a choice one has to make, which sometimes makes great demands on us. It may require that we change our lives in radical ways and give up the security we have known in order to be true to our path. This is certainly what happened to me. I felt compelled to get a divorce and take my five children to Washington, and this was very hard for us all. But there was no room in my marriage for me to be the person I had unexpectedly become. I was suddenly a co-creative woman. I could no longer be just wife and mother. Still, that break was very painful. At the point that you discover your purpose and decide to pursue it, you have to expect a re-patterning of your life. The cost may be high. But I think it is always worth the price, because you find yourself growing and in a state of flow. There is happiness, joy, companionship, excitement and fulfillment. The discovery of vocation is absolutely essential for conscious activism, because now you are not acting out of anger or a personal desire to fix things up. You are acting as an expression of deep intent. When activism is motivated from the deepest level of consciousness, you are being activated at the soul level with a calling forth of your life purpose. This is your true vocation, your soul's code– that inner guiding genius that each one of us possesses. Its arousal is the next stage of your evolution as a person. If you are not activated to express that uniqueness through some form of ongoing service, then true fulfillment will elude you. James Hillman writes about this in The Soul’s Code. Co-creation involves tapping into the universal creative life force that flows within us all and then joining one’s genius with that of others and learning the pathways of resonance together, loving the other as oneself, listening with compassion, learning how to speak the unspoken and not harboring hidden resentments. 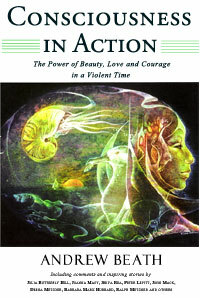 I fell in love with a purpose that was transcendent to myself, and Eros was the creative force that awakened me to Telos, which the dictionary defines as “the end term of a goal directed process.” I coined the term telerotic to mean falling in love with the potential fulfillment of our evolutionary purpose, as I foresaw it in the vision. One of the things that is absent in most people today – even among the conscious activists who do their work in community with others – is a shared vision toward which the activism is aiming. I don't believe it is sufficient just to work to fix up the obvious problems. We need to strive to fulfill the vast evolutionary potential of the human species, including the spiritual, social, artistic and scientific. I see my role from an evolutionary perspective as helping to bring forth a shared vision of humanity as an awakening entity. This vision adds dimension and gives context to the goals of planetary sustainability. We were not called forth en masse to activate our soul code and co-create together until the planetary crisis was at such a level that, without this kind of guiding genius and universal love, we would not survive. Many of us who are working for planetary change have been working in isolation. But the deeper thing that was happening for my friends and me was the discovery of community. Within that larger group of pioneering souls, we established a resonant field that supported the growth of each of us. Sometimes the field was palpable. It felt like a harmonious medium of empathy. The field accelerated our personal growth as well as deepened our sense of vocation. It felt to me as though we were experimenting with an early form of synergistic democracy, or “synocracy.” This is a coming together of individuals in such a way that all are able to more fully express themselves within the context of the whole than if they were separate. I am finally experiencing a social incarnation, which is when one’s conscious activist intention finds collaboration with others whose vision is commensurate with one’s own. As mentioned, it involves more than fixing problems or preventing something terrible from happening. It is actually participating together to create that world that you are called to bring forth from within. If you do a planetary scan, you’ll see that communities are forming everywhere, and these communities are each holding the collective coding as well as the blueprint for a specific mission. I think of these communities as separate yet interactive organs in the social body. And the potent interactions of these organic communities assure that the larger social body will be far greater than the sum of its parts. I believe that there are enough of us now to create global change and that the next step is to find our resonance and connectedness beyond the separate endeavors that people are involved in. If I could frame it as a planetary birth experience, I would say that this new culture we are endeavoring to create has already been born. Millions have awakened: We all saw Earth as one body from space; the environmental movement woke us up to the fact that pollution that occurs in one small part of the world affects the larger body; women woke up and realized that they have an essential contribution to make to the world; and the human potential movement is making a better future possible by providing an array of new technologies for facilitating and accelerating self-actualization. I believe that the lights are about to turn on all over the world. Every single turned-on person is enlightened in a fundamental way and a catalyst for change, and everyone not yet turned on is in the process of growing brighter. My purpose now is to find ways to support the collective nervous system of this emerging new culture by building stronger, synergistic connections between us. There are more than enough awakened people, but we are mostly functioning in separate clusters with minimal awareness of other communities of activists. Yet so many of us are working for the same goals, and there is strength in numbers. So this is conscious activism: supporting the development of each universal human, which will lead to the conscious planetary awakening that I foresaw. And the beauty of this is that we probably already have the know-how, the technology and the resources to fulfill our goal of sustainability on the planet. When two or more people with poised minds are gathered, there is that sense of effortless flow and spontaneity. And what I mean by poised mind is that we are not trying to figure things out or to devise strategies. We are simply experiencing the moment and allowing the larger design or pattern of action to be revealed. There is no reason to assume that Homo sapiens has reached the ultimate human form. We’re not stopping here, and that is the real hope of the world."